Chicago Blackhawks centre Jonathan Toews celebrates after scoring the winning goal against the Vancouver Canucks on Feb. 7, 2019, in Chicago. Jonathan Toews joked he was out of gas. He had at least one terrific play left in the tank. Toews scored 3:21 into overtime to lift the Chicago Blackhawks over the Vancouver Canucks 4-3 on Thursday night for their season-high sixth straight win. 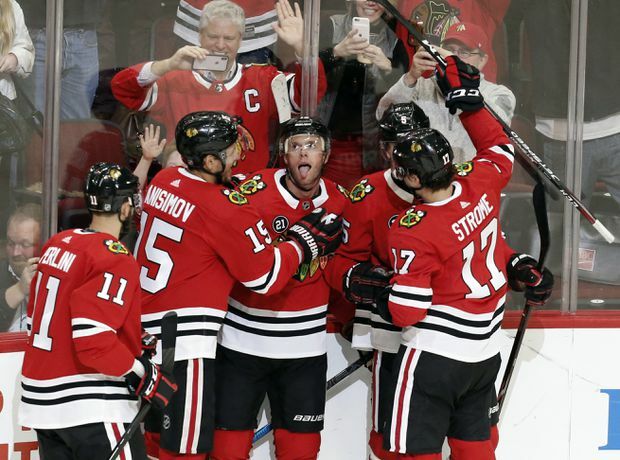 Toews stuck out his tongue to feign exhaustion as he was mobbed by his teammates. “We feel every time we’re on the power play we’re a threat,” Blackhawks coach Jeremy Colliton said. Strome has clicked with DeBrincat after coming to Chicago from Arizona in a trade on Nov. 25, 2018. The two starred together as junior players with the Erie Otters of the Ontario Hockey League. Vancouver coach Travis Green said his team played better on the swing than the record suggests. “We could be sitting here with six or seven points on the trip,” Green said. Chicago’s Collin Delia made 40 saves, while Markstrom blocked 31 shots in his sixth straight start. Green maintained the Canucks were better than the Blackhawks at even strength.